Scientists from India performed an experiment where asphalt which is commonly used for road pavement was modified using castor oil based polyurethane to improve the properties of asphalt such as resistance to permanent deformation and to reduce the fatigue. Polyurethane pre-polymer (PUP) was prepared by using castor oil and toluene diisocyanate (TDI). 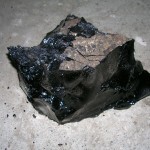 Asphalt modification was done using castor oil (C.O.) and PUP. Results showed that polymer modified asphalt showed improvement in properties such as hardness and softening point thereby making the pavement application smooth. This entry was posted in Castor oil Polymers, Castor Research and tagged castor oil polyurethanes, castor oil research by Gayathri. Bookmark the permalink.